Southern Harm nominated you as the next featured skater. She said she knew you had skated before joining Hard Knox. 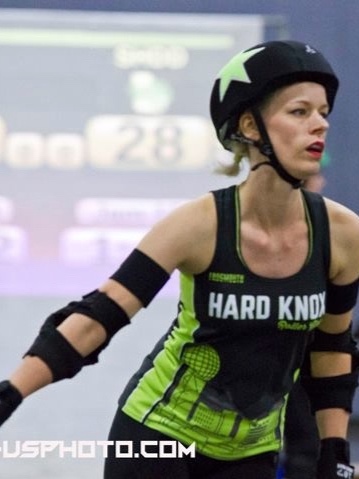 She wants to know about your transition to derby and how you got into the sport. Well, I was googling skating lessons for my children and didn’t come across any. What came up in the google search was the Fresh Meat program. It was going to start in 2 weeks, so I filled out the form. Two, and I had to teach them to skate myself. But you had skated for a while before Hard Knox, but it is different. 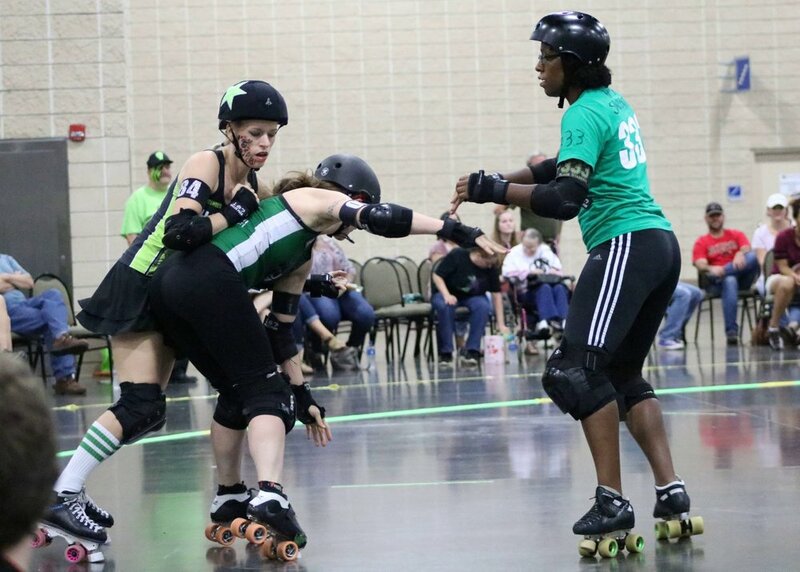 What was the transition like to roller derby? Well, I used to skate outside when I lived in Savannah when I was in college. I used to skate to work which was challenging (cobblestone and bricks). Their streets are not skate friendly, but it got me to work faster than walking. I didn’t really do much park skating here until after I started Fresh Meat. I am married to a skateboarder, but I didn’t go myself. Didn’t you skate when you were younger, too? I used to figure skate on quads as a very small child. I was not great at it, mostlyfrom lack of motivation. As a 5-year-old…My sister was really good at it, and I got her hand-me-down skates, and hand-me-down costumes, and probably hand-me-down routines. And I would skate in competitions against her. I didn’t know that was kind of a weird thing as a kid. Quad figure skating was in Junior Olympics, from what I’m told. I have not actually fact checked that, but my mom was convinced we were going to be skating superstars. Well, my sister, not me. And then my dad found out how much it cost and we had to quit. But we still went to the skating rink every Saturday. We were rink rats. Last year was your first season. What was your biggest take away from last season as a whole? I wish I had started sooner. 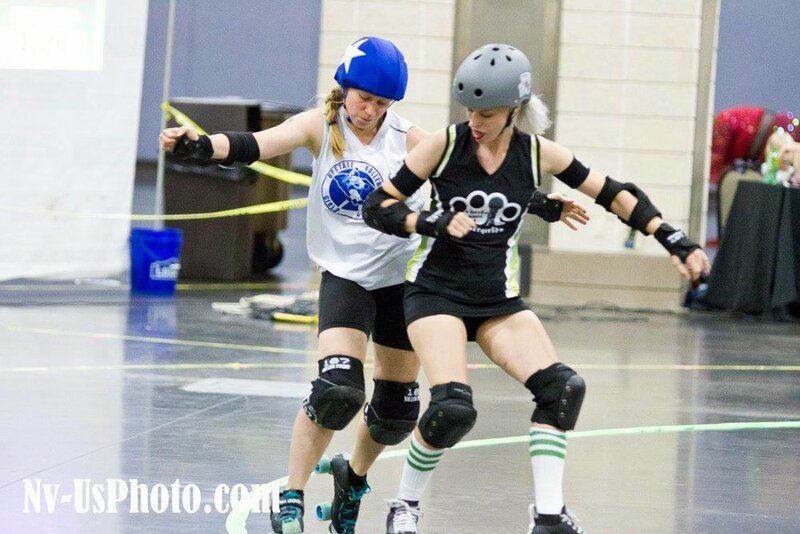 Derby is something I had thought about off and on for a decade before I joined, because I’ve always loved to skate. The things that made me hesitate to start turned out to be a complete non-issue. Mostly being socially awkward, and having a massive fear of public speaking and just being in front of people in general. I thought bouts were going to be torture. 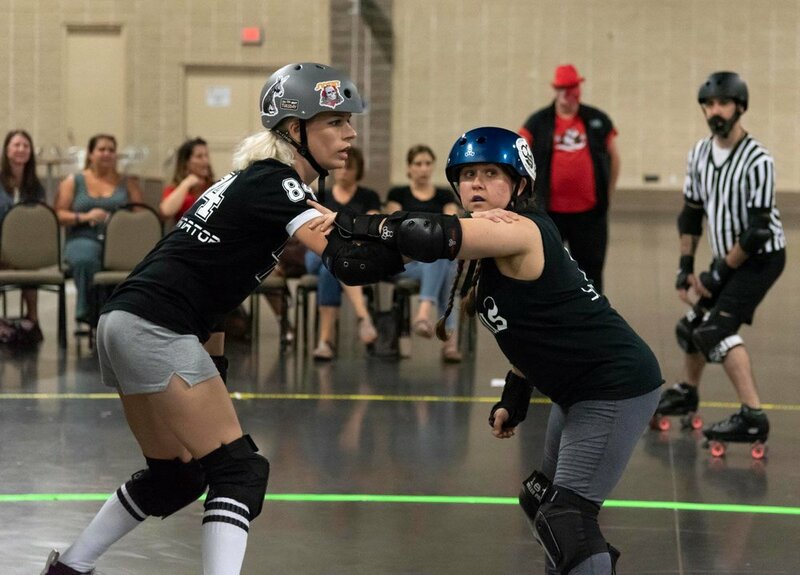 I think it was the first time I jammed, someone called out my name right before the whistle, which I’m sure was intended to be supportive, but it freaked me out and made me hyper aware that there was an audience for how unprepared I was. Aside from that, I haven’t really noticed that people are watching because I’m focused on the game. What was one of your favorite memories from this last season? When we won. We won that one time. It was fun meeting all you lovely ladies. And skating is my favorite exercise. To learn how to hit people. Effectively. I want to make them move. You went with the derby name Thurmanator. Why? Well, my last name is Thurman and it was the low hanging fruit. My other suggestion, no one got. What were your other ideas? As we begin this next season, we have some new skaters joining us. Do you have any words of advice as they take the track for the first time? Be patient with yourself. There are lots of skills to learn, and the rules are complicated, but this is such a welcoming and supportive group. Your teammates will help you figure it out. Tell me about Smarty Pants Paper Company. It started as a side-hustle. I opened my Etsy shop in 2005 when the site was pretty new, and sold note cards and whatever else I decided to make at craft fairs. After I had kids, I stopped working, and starting growing Smarty Pants so I could stay home with my girls. I design note cards and fun little gifts, with lots of puns and bright illustrations. You can still find me at craft fairs once in a while, but most of the business is wholesale. My stuff is sold in about 200 stores at the moment. My goal is to have a retailer in every state, I’m only missing 3. As a strong, female athlete, entrepreneur, and mother, you serve as a great role model for your children. How do you want them to see you/what lessons would you like them to learn from your life? For some reason being around me in my studio makes them think I work more than my husband, even though he is still at his office while I’m hanging out with them in the afternoons, so hopefully they will view me as a role model and not a work-a-holic. I think it’s important that they see me trying to reach my goals.I’d like them to learn to be self-sufficient and not be afraid to take risks, and to value themselves and their time. I’m also trying to teach them that their interests shouldn’t be defined by what other people consider girl things or boy things. I remember being mad as a kid when the adults in my life expected me to fit into their idea of what was appropriate for a little girl. Even today people don’t always take me seriously as a business owner because I’m a woman. I don’t want my kids to feel like there are any limitations placed on them. I can already see it creeping in from outside influences, and I try to shut it down. I don’t want them internalizing that nonsense. What is your gear set-up? I’m still working on getting all the gear I want. I got the cheapest pads, borrowed a helmet, and did Fresh Meat in the skates I bought in 1998. My skates fell apart right before the skills test. Now I have an S1 helmet, and Riedell blue streaks with Avenger plates and 95 Radar Halo wheels. Who would you like to nominate and what would you like to know about them? I would like to nominate smalls. I would like to know what sparked her interest in derby. Thank you, Thurmanator, for sitting down with me, and thank you all for taking the time to better get to know one of our HKRG family. We are so excited about this upcoming season, and we have so many great things planned. Come out and meet Thurmanator and all the HKRG family at the Mardi Growl Parade (March 2) and at our special viewing of Whip It presented by Central Cinema (March 16). Follow us on your favorite social media platform to stay up to date on all the HKRG news.